The conference ELECTRONICA 2019 (IEEE Conference Record Number 47796) continues the discussion initiated by Electronica 1991 on the state and prospects for the development of the Bulgarian electronics research, education and industry in a globalized world economy and EU membership. Papers discussing theoretical and applied electronics are submitted and presented by leading Bulgarian and foreign specialists. The conference is attended by many of Bulgarian and foreign companies. An exhibition and Round table discussion is organized. The official conference language of the submitted papers is English. Prospective authors are invited to submit papers on the conference topics. Each author can participate in at most three papers. A two-page digest for each paper should be submitted together with the pre-registration form. It should contain the title of the paper, authors and contact information, a short abstract, keywords, the main contents of the paper and references. Each digest will be reviewed by two reviewers. Accepted and presented papers will be published in the conference CD proceedings and submitted to the IEEE Xplore® Digital Library, as well as for indexing in Scopus and Web of Science. The 16th International Conference on Electrical Machines, Drives and Power Systems, ELMA 2019 takes place June 6-8 2019 in Varna. The aim of the conference ELMA 2019 is the desire to give opportunity to academics, scientists, engineers, PhD students, manufacturers and users of advanced technologies to discuss and exchange information about the results of their theoretical and experimental investigation, the utilization of new materials and application of innovative technologies in the field of electrical machines, drives, power electronics and power systems. InfoTech is an international forum for scientists, researchers, industrial experts to share innovations, experience and new research results in the fields of Information Technologies and Information Security; Technologies for System Design and Intelligent Systems; Technological Aspects of e-Governance and Data Protection, etc. The forum is a successor of International Conference on Systems for Automation of Engineering and Research (SAER), established in 1987 and International Workshop on e-Governance and Data Protection (EG&DP), established in 2005. 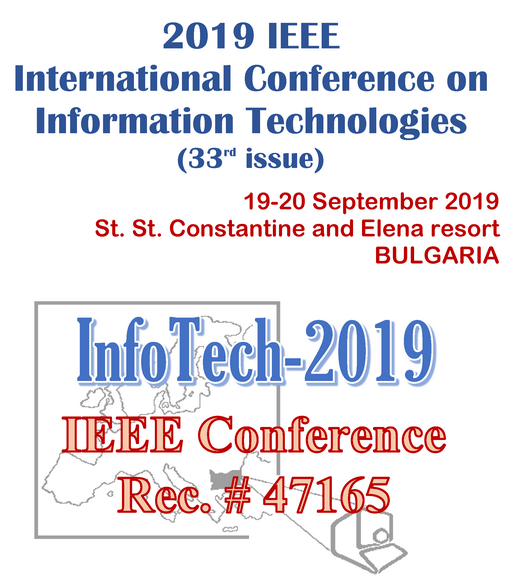 InfoTech is registered as an IEEE Conference since year 2018.